Boris Giltburg had a free evening in London. So he called Stewart French and asked him to film him playing Rachmaninov's Op.39 Etudes-Tableaux overnight. Well, whyever not? Here's the result, which he's just sent me, and there's a blogpost at Gramophone that tells the story. Interesting info re the spelling of Serge(i) Rachmaninov/ff has been popping into the in-box since my post the other day, so here's what they're saying. "As I understand it from my grandparents, -OFF was their generation's anglicization of the Cyrillic letter B (lower case). The 20th century generations chose the -OV, partly because it's one less letter to deal with. Also, the Cyrillic B can be pronounced like an f or a v, so it's kind of toss-up - that evidently continues." "The solution is simple, though the inconsistency is maddening: both Prokofiev and Rachmaninov were known in France as 'Serge' and with two ffs, the French transcription. They were published by Editions France de Musique which was bought up by Boosey and Hawkes, hence the publisher's insistence...The Rachmaninoff Society insists on this, and the foundation is supporting the concerts... I ALWAYS put v (and one s in Musorgsky, no reason for two in transliteration. 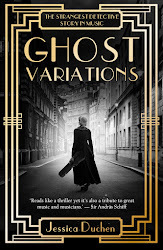 And always Ye for the Russian E (ie Yevtushenko, Yesenin, Yevgeny, Yelena...)"
Critic and author Matthew Rye adds: "I had always understood that the 'ff' was R's own self-spelling when he moved to the US (in the same way that Schoenberg chose to lose his umlaut and added the first 'e', and Rubinstein became Arthur rather than Artur)." John Riley says: "Academically it should be Rakhmaninov, but that seems the least popular option." The discussion has put me in mind of my experience aged 18 in what would now be called a gap-year internship, but was then simply a part-time job in a year out between school and university. (It was paid, too, and we even got luncheon vouchers.) I was lucky enough to be taken on as office junior by a famous musical publication with an eminent editor, whose letters I had to type from audio-recorded dictation - and he had spelling issues that I simply could not fathom. They were far indeed from Music A level. Skryabin, for a start; and I think my fuzzy memory must have blanked out his solution to the -off/-ov issue. The most confusing, though, was Chaikovsky, with no T. The terror that this struck into my heart has never quite left me. Last night the LPO's Rachmaninoff: Inside Out celebration got off to an astounding start at the Festival Hall. Phenomenal playing in The Isle of the Dead and the Symphonic Dances (let's leave aside the soloist in the original version of the Piano Concerto No.1 for now), with man-of-the-moment Vladimir Jurowski at the helm, fresh from the announcement that he's staying on as principal conductor for another three years. Great audience and much enthusiasm. But immediately we ran into trouble. The series - the biggest-ever celebration of the composer's works with orchestra, involving operas, concertos and lots of different versions of things, and extending across 11 concerts this season - is called RACHMANINOFF: INSIDE OUT. Meanwhile we have all been writing about RACHMANINOV. With a V not a FF. Which is correct? And a quick dip into the video introductions on the LPO website thickens the plot when their presenter names him SERGE Rachmaninov/ff, not SERGEI, which was his name. Meanwhile, woe betide any concert-goer in London who doesn't like Serge/ei Rachmaninov/off, because over at the Barbican during the course of this season the LSO is busy doing him too, with Gergiev (when he's around - he has quite a busy schedule just now) and pianist Denis Matsuev, who for some reason is their featured artist this autumn. Didn't someone check the calendars? Or maybe as the LPO is doing RachmaninOFF and the LSO is doing RachmaninOV, no clash was perceived? Well, whatever you call him, it is high time Mr R was recognised as the first-rate composer he always was - time to shake off the silly old prejudices about tonal music in the 20th century, please - so all this comes not a moment too soon. The more, the merrier. "Music has a very simple task - to move people"
This is the radio broadcast from Voice of Russia UK in which Rustem Hayroudinoff and I talk to Alice Lagnado for Curtain Up about reaping the rewards of Rachmaninov. Enjoy! The trouble with burning the candle at both ends is that while you're out and about, you're not writing. Therefore JDCMB is a little bit late with what follows. Leif Ove Andsnes gave the same programme twice at the Wigmore Hall last week; I attended on the second night (11 April). Not sure what's with Beethoven Op.101 this season, but this was the fourth time I've bumped into it since October; this time it joined a mixed programme including Beethoven's Op.54, Bartok's Suite Op 14, an all-too-rare rendition of Liszt's 'Pensées des morts' from the Harmonies poetiques et religieuses and Chopin's C minor Nocturne and Fourth Ballade. Andsnes has one of the most sheerly beautiful sounds to be found on today's pianistic platforms; a super-cool customer, personable and unpretentious, he plays as if in a trance, cocooned at the piano in a world of his own. There's an almost scary perfection about him - a sole wrong note came almost as a relief, as if to say, "ah, this guy is human after all". Yet it can be flummoxing to hear the rugged Op.101 and the ferocious folksiness of the Bartok sounding as smooth as butter and the Chopin Ballade so precisely navigated that there seemed little time to "stop and smell the flowers". That exquisite moment when Chopin enters an hypnotic state of enchantment - spinning out a few bars of melody over four-against-three ripples in an aural-optical illusion - disappeared into its own notes with no time to catch the light and shine. Nevertheless, the C minor Nocturne, its melody shaped with microscopically precise sensitivity and beauty, giving way to a mingling of chorale and octave storms that sends the cantilena into a fever of overturned emotion, was perhaps the high point of the concert. A treat and a half to hear such playing at close quarters rather than in the huge RFH. Sunken Garden, ENO's world premiere from Grawemeyer Award-winning composer Michel van der Aa, took over the Barbican Theatre for a week. Opera in 3D? Korngold once said, when he went to Hollywood, that some day whole operas might be written for the big screen; and here it was, with knobs on; one such knob being 3D specs that can be worn over your normal specs (v useful). As a 21st-century way of conceiving a musical stage work, mingling live performance with pre-recorded film including holograms of several singers who do not appear in the flesh, but with which the on-stage singers must interact, it's a presentation that needs - and received - the slickest and cleverest of integration in performance. Responses have ranged from "this is the future", downwards. Several concerns. First of all, this opera has much in common with many "traditional" operas in that its story is so convoluted, and the enunciation of the (amplified) singers so unclear (except for the excellent Roderick Williams) that it was next to impossible to work out what was actually going on. Themes of conscience, cot death, euthanasia, afterlife, Dr Who-like self-projections, mystical oneness with the planet (think parachuting - but why?) 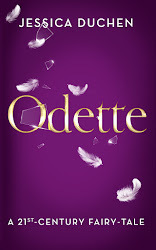 - all mingle in David Mitchell's imaginative yet overstuffed libretto. We enter the Sunken Garden - actually the Eden Project - through a door under a motorway and find ourselves in limbo with some lost souls and an evil, or not, mastermind, or... hmm. While the music undoubtedly has its moments - such as some memorable effects achieved by layering repetitive snatches of film and matching soundtracks - the number one requirement for a successful opera is that the music should be the best bit; the words should provide the runway from which it can take off and fly. Perhaps Sunken Garden's chief problem is that it is so busy dazzling us with its special visual effects that the aural element begins, inadvertently, to take second place. It is all hugely inventive and ground-breaking, significant indeed for the future of opera, yet not wholly successful in its own right. 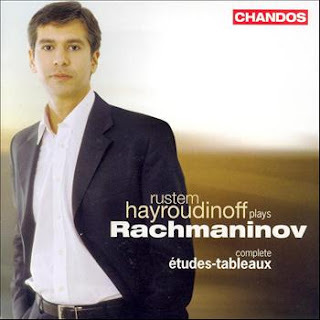 The following night, Rustem Hayroudinoff played at St John's Smith Square, in an evening that had a fraction of the audience yet twice the impact (at least for us pianophiles). Rarely do you see the entire listening assemblage jump to its feet at the final note. This one did. 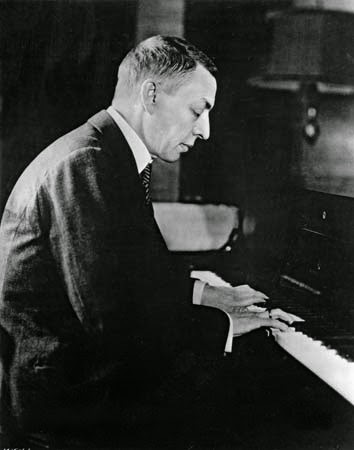 The Rachmaninov Piano Sonata No.1 is rarely performed - probably because it is too difficult. It's a Faust Symphony for one instrument and ten fingers, and there is more extraordinary music in a single bar of it than in certain entire evenings of...well, you get the idea. Rachmaninov weaves the work from a range of symbolic leitmotifs for different aspects of Faust, Gretchen and Mephistopheles (helpfully illustrated by Hayroudinoff in his spoken introduction). These pianistic textures would sound as complex on a 100-piece orchestra. As a feat of out-and-out virtuosity it is unremitting, indeed mind-boggling; but to deliver the wild flights of Rachmaninov's imagination with such colour, fidelity, rigour, fire and serious bedazzlement is a phenomenal achievement. Hayroudinoff's performance brought back to life the grand Chaliapin-inflected Russian style, with a depth of perspective in the voicing that was more convincingly 3D than anything we saw in that physically 3D opera. If someone doesn't frogmarch him into a recording studio and insist that he records this gargantuan piece to add to his impressive roster of benchmark, award-shortlisted Rachmaninov discs, then those of us who were there last Saturday will simply have to throw tantrums until they do. Oh, and he also played some extremely fine Bach and Liszt - the small matter of the Second Partita and the Mephisto Waltz No.1 and more. What price trouser-pressed perfection? What price technological novelty? All you need is one person, one instrument, music of genius and a performance infused with the fire of absolute inspiration, awareness and understanding. That is worth ten, probably a hundred, of anything else. That's what the musical experience is all about. And with that little piece of profundity for a Sunday afternoon, I'm off to hear Jonas Kaufmann at the RFH. Tonight at the RFH it's Sergei's turn. The fabulous Simon Trpceski plays the Third Piano Concerto and the LPO top it off with the Second Symphony. Yannick Nezet-Seguin is sadly off sick, but Mikhail Agrest has stepped in to save the day. Oh, and it's full (might be some returns, though, from Yannick fans). Yes, 20th-century music is popular when it's allowed in from the cold. It's also true that the greatest music has something indescructible about it. Vivaldi, Bach, Mozart, Tchaikovsky and Chopin are just a few of the other towering figures whose works have been set, reset, ripped off, shredded and otherwise bowdlerised, and still survive and often sound as good as ever. That puts Rachmaninov in excellent company. Try Chopin. Once a Parisian sophisticate, always a Parisian sophisticate. T'other day I was out shopping when the girl behind the counter, returning my credit card, handed me a gift of a Christmas cracker covered in sparkles. I think our neighbours must have got one too, because they put through our door a cracker joke that runs: "Which players can't you trust in an orchestra? The fiddlers." The trouble with the sparkles is that they're fairy dust and they fall off. Next thing you know, they're on the kitchen floor, in the cat food, under the piano, on the train and, by now, probably all over the Royal Festival Hall. And they've got into JDCMB. We all sometimes need to get our sparkle back, so here are five favourite bits of musical glitter and winter snow to light the long evenings, aided and abetted by some great dancing. And they're not all Russian. Don't forget that this Friday it's the Winter Solstice and time for the JDCMB Ginger Stripe Awards! Tchaikovsky: The Silver Fairy variation from Act III of The Sleeping Beauty (look! No Nutcracker!). Danced by the Royal Ballet's Laura Morera. Brahms: Es tönt ein voller Harfenklang. (Yes, there are sparkles in Brahms. Just listen to this...) Abbado conducts members of the Berlin Phil and the Swedish Radio Choir. Rachmaninov: Suite No.2 for two pianos, second movement - Waltz. Alexander Goldenweiser and Grigory Ginzburg don't play it as fast as Argerich and Freire, but there's time to wallow in the glitter. This is a huge favourite of mine: Alexander Goldenweiser and Grigory Ginzburg play the Valse from Rachmaninov's Suite No.2 for two pianos. I love the laid-back tempo, the subtle rubati, the wealth of detail, the sultry tenor tone when the big tune comes through - and no histrionics or thumping. Just a perfectly-measured mix of musical haute couture with the poetry of partnership. Goldenweiser, besides being a famous pedagogue and one of the central figures of the fabled 'Russian School' of pianism, was a great friend of Tolstoy's, played to him frequently and kept a notebook about his meetings with the great writer which was eventually published as Close to Tolstoy (if I can track down a copy of this by hook or crook, we'll come back to that later). More about Goldenweiser at the Toccata Classics site, here. But need it for an appropriate expletive in response to this alarming story reported by Matthew Guerrieri yesterday, with a link to the Arizona Daily Star which has the details. It seems that Rachmaninov's great-great grandson is planning to have his famous forefather's works rearranged so that they can be re-copyrighted. This is deeply unsettling. I'm not convinced that Jane Austen's descendents would have been quick to scribble adverbs all over Pride and Prejudice in order to declare it a new work and pull in even more £££s. And can you imagine a member of the Shakespeare clan rewording for similar purposes - "To exist or to exist not, that is the decision..."
Though I'm as prone as any writer to get stewed up about authors' and composers' rights, a sensible line does need to be drawn, doesn't it? Shades of the Hyperion-Lionel Sawkins case...where will the issue go from here? Blimey! The missing manuscript of Rachmaninov's Second Symphony has turned up, in a Co-op bag. Geoffrey Norris authenticated it and has the story in today's Daily Telegraph. Big thanks to Anna/Robin Hill for the tip-off. Meanwhile I'm still wiping off smudged mascara after seeing La Boheme at English National Opera last night, in their now classic production, set in the 1950s, by the late Steven Pimlott with the sparkling translation - now viewable in surtitles - by Jeremy Sams. Odd thing about opera (Lieder too, for that matter): it's pure masochism. The more you cry, the better it's been. Hmm. Boheme gets to me every time, but this was simply superb, with ace performances all round, especially from Mary Plazas (Mimi), Peter Auty (Rodolfo), Giselle Allen (Musetta) and Mark Stone (Marcello). Before the show I was too busy talking to our congenial companions for the evening - some of the staff of a new blog sponsored by Sky Arts, ArtsWOM (=Word Of Mouth) - to notice who was conducting, but was very impressed by the pacing, sensitivity and use of silence. It turned out to be Xian Zhang, clearly a maestra to watch out for in future.